The dreaded 0-2. It’s relevant every year around this time. And why shouldn’t it be? Since 1990, when the NFL went to 12 playoff teams, 87.8 percent of teams who started 0-2 missed the playoffs, according to ESPN Stats & Information. 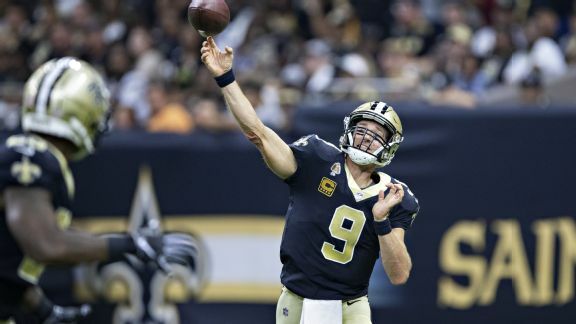 Sure there are outliers -- one each of the past five seasons including the New Orleans Saints last year -- but it’s an unenviable position 16 teams are trying to avoid this week. Among them are the New York Giants and Dallas Cowboys. They meet Sunday night in a massive game at AT&T Stadium. It’s a contest that will likely determine where each team is headed in 2018. May the best team avoid 0-2. Cowboys: They have been winless after two games eight times in franchise history and made the playoffs just once in those seasons. That one time came in 1993 when Emmitt Smith rode to the rescue after a two-game contract holdout. Five times since Jerry Jones has been the owner and general manager the Cowboys have started 0-2. Taking out the ’93 season, the Cowboys have finished 6-10 (2010), 5-11 (2001), 5-11 (2000) and 1-15 (1989). Between the 2009-12 seasons, none of the 48 playoff teams started 0-2. However, there's been at least one playoff team that started 0-2 in each season since. Last year, the Saints were the team that rebounded from an 0-2 start and won the NFC South. Giants: They have started winless after two games 18 times in franchise history and made the playoffs once in those 18 seasons. That was in 2007, when they lost to the Cowboys and Packers before ripping off six straight wins. Of course, the Giants went on to win the Super Bowl that season. It provides a glimmer of hope that if they start 0-2, there is a chance to salvage something. The odds are against them though. Fifteen of the 18 seasons the Giants started with two straight losses have ended with a losing record, including four of the previous five seasons. Shurmur: He’s looking for his first win as head coach of the Giants. If not now, when? It’s not going to get much easier for Shurmur and the Giants moving forward. They play at Houston next week, host New Orleans, play in Carolina, take on defending champion Philadelphia on a Thursday night and then play in Atlanta on Monday night. Ouch! Shurmur’s first season could go south quickly if he doesn’t win in Dallas. That would put him to the test before he’s even had a chance to say hello. Garrett: He entered the season under the microscope, despite Jones’ assurances in training camp. In 2010, the Cowboys lost their first two games and opened up 1-7, which led to Garrett taking over for Wade Phillips. The Cowboys are one of the youngest teams in the NFL, so getting positive reinforcement early in the season might mean more to them than a veteran squad. If Garrett can’t get the team on the rails, then his job security will become a bigger story. Giants QB Eli Manning: The opener didn’t go especially well. Manning didn’t throw a touchdown pass, except if you include the one the Jaguars ran back. There are no more excuses, despite an offensive line that remains problematic. He has all the weaponry in the world. There were plays to be made last Sunday in the opener against the Jaguars. This is an important game for the 37-year-old Manning, especially if Sam Darnold plays well again for the Jets. The Giants passed on Darnold and quadrupled down on Manning this offseason. Cowboys QB Dak Prescott: Prescott’s 11-1 start to his career seems so long ago. The passing game has not been able to get out of the ditch since Ezekiel Elliott’s suspension at the midway point of last season. Prescott has had more than 212 yards passing in just one of his past nine games. He has not thrown a touchdown pass in six of his past nine games. In 2016, there was no doubt Prescott was the right guy for the Cowboys’ present and future. If the Cowboys lose Sunday night and the passing game struggles again, then Prescott’s role in the future will be a bigger topic. Giants: The Giants have to stop the run. Put the ball in Prescott’s hands and they “have a better shot of winning,” according to Giants safety Landon Collins. It’s no secret Dallas is built around their rushing attack. It is 10-2 in games when Elliott rushes for at least 100 yards in the regular season. The Giants also need to protect Manning a little bit, and have him make more plays. That likely means providing a lot of help for Ereck Flowers and the right side of the offensive line against Pro Bowl defensive end DeMarcus Lawrence. He devoured Bobby Hart last year and would likely do the same to Flowers if they’re matched one-on-one most of the afternoon. Flowers allowed seven pressures in the opener. Cowboys: The formula is not difficult to figure out. The Cowboys want to establish the run with Elliott and mix in an efficient passing game. Prescott’s numbers are never going to be massive, but he has shown the ability to make the timely plays, especially when the doubts creep in about him. For all of that to happen, the offensive line will have to play better. Tackles Tyron Smith and La'el Collins had two penalties in the season opener. Rookie left guard Connor Williams gave up two sacks. It’s been a struggle against New York. The Cowboys have averaged 18.8 points per game vs. the Giants in four Prescott starts, with 20 of their 30 points in their win last December coming in the fourth quarter. If they lose, when will they win? Giants: Wow, it’s hard to find a win for the Giants if they can’t beat the Cowboys this week. Maybe next week in Houston? If not then, maybe not until Week 8 when they host the Redskins. At least that is the first time they will probably be favored in a game this season (maybe). Surely as long as Odell Beckham Jr. and Saquon Barkley are on the field they will steal a game somewhere in the first four or five weeks, but they would be in a dire situation if they can’t beat Dallas considering their schedule. Cowboys: In Week 3, the Cowboys travel to Seattle, which is traditionally a difficult place to leave with a win. In 2014, the Cowboys’ victory in Seattle gave them confidence that they could be among the NFC’s elite and they finished 12-4. These Seahawks aren’t those Seahawks, just as these Cowboys aren’t those Cowboys. If they don’t beat the Seahawks, then the Week 4 meeting against the Detroit Lions looks like the best bet. Did you see the Lions on opening night? Yeesh.